Osburn chimney liner offset adaptor 6". The adaptor allows your flexible liner to be offset to the rear of an insert outlet. 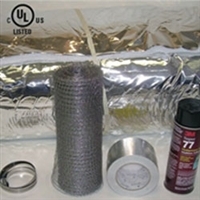 Precisely sized foil faced 1/2" Super Wrap insulating blanket, retractable mesh, spray adhesive, foil tape and clamps. The convenience of everything you need in one box! 4" x 25' Kit includes flexible stainless steel liner, 13" x 13" top plate, chimney cap, and 3" x 4" appliance adapter. Type 316Ti stainless steel liner. Please verify that this venting solution meets the requirements for your pellet appliance before ordering. Typically used with pellet burning fireplace inserts. K5A425 with special 3" x 4" adapter. 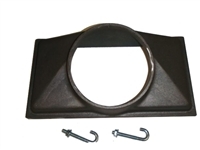 4" x 30' Kit includes flexible stainless steel liner, 13" x 13" top plate, chimney cap, and 3" x 4" appliance Tee adapter. Type 316Ti stainless steel liner. Please verify that this venting solution meets the requirements for your pellet appliance before ordering. Typically used with pellet burning stoves vented through fireplace or thimble in masonry chimneys. K5T430 with special 3" x 4" Tee. 6" x 25' Kit includes flexible stainless steel liner, 13" x 13" top plate, chimney cap, and tee with removable snout. Type 316Ti stainless steel liner. Insulation kit sold separately. 4" x 25' Kit includes flexible stainless steel liner, 13" x 13" top plate, chimney cap, and 3" x 4" appliance Tee adapter. Type 316Ti stainless steel liner. Please verify that this venting solution meets the requirements for your pellet appliance before ordering. Typically used with pellet burning stoves vented through fireplace or thimble in masonry chimneys. K5T425 with special 3" x 4" Tee. 4" x 35' Kit includes flexible stainless steel liner, 13" x 13" top plate, chimney cap, and 3" x 4" appliance adapter. Type 316Ti stainless steel liner. Please verify that this venting solution meets the requirements for your pellet appliance before ordering. Typically used with pellet burning fireplace inserts. K5A435 with special 3" x 4" adapter.